Growing up on The Muppet Show in the '70s, I figured out right that Miss Piggy was never going to be my favorite muppet. While Fozzie Bear is happy-go-lucky, Gonzo is sweet, and Animal is crazy -- but in a good way -- Miss Piggy is just plain mean. Now with the impending premiere of the sitcom The Muppets on ABC and the hoopla over her split with her long-time paramour (frog husband?) Kermit after nearly four decades, I can honestly say that my disdain for her has not diminished after all these years. She is downright annoying. 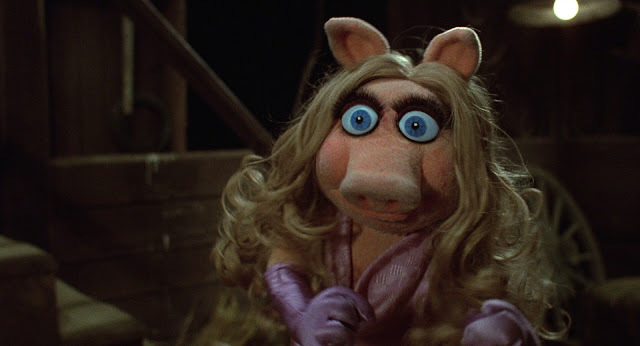 In fact, I'd go so far as to say she's nearly the muppet equivalent of Debra Barone. This is one muppet that could make a vegan turn into a carnivore. Where to begin? She's a narcissistic, loudmouthed diva with a penchant for childish, over-the-top behavior when she doesn't get her own way. She was also convinced that she was destined for stardom decades before a lot of our children and teens got infected with the very same "I wanna be famous" disease. And then there's the way she constantly refers to herself as "moi" and uses poor grammar such as "I gets" in a high pitched, phony, singy-song voice. Very annoying, indeed. I have enormous respect for Jim Henson and all that he created. But when you consider that Miss Piggy was originally supposed be a minor character until her swollen ego took over, one must wonder what The Muppets would have been like without her. I'm surprised she didn't make herself the center of attention at his funeral. She's also a psychopath. More on that in a minute, but I invite you to look at the photo below and ask yourself, is this what normal looks like? She has "crazy eyes" -- the same expression we've seen on every American shooter who has opened fire in public over the past five years. I caught part of the Good Morning America interview with Miss Piggy the other morning; of course, the interviewer wanted to know what went wrong between her and America's favorite frog. The question that GMA and everyone else should really be asking is, "Why did Kermit put up with this pig's BS for so long?" This pig (gosh, it feels so good to write that) is the biggest hypocrite going; it's OK for her to fling herself shamelessly at male co-stars, but if Kermit so much as looks at a female actress or singer, he gets a "hi-YA!" and a karate chop to the mid-section. Actually, Miss Piggy is downright abusive -- how many times did Kermit get used as a karate chopping block or a punching bag? How many times did we see him go sailing through the air, his head hitting the show's stage curtain? Feminists may argue that she's a great example for women, but if the tables were turned in this relationship and the frog was doing the abusing, OH BOY. And he put up with it! You would have to be a dummy to tolerate this kind of behavior. 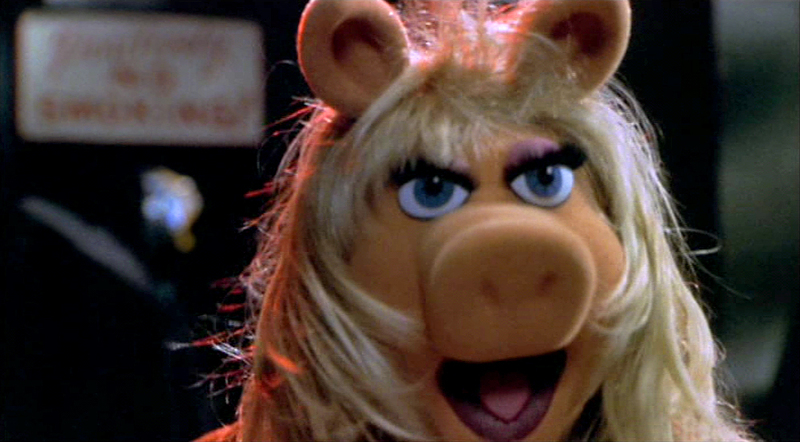 No male guest star on The Muppets was off-limits from Miss Piggy's advances. She even tried to put the moves on Elton John. A gay man. Who does she think she is, Elizabeth Taylor? Numerous times she has tried to manipulate Kermit into getting jealous -- an immature tactic that doesn't stick when there are two adults in a relationship. Fortunately, it never worked. And she's superficial, too. 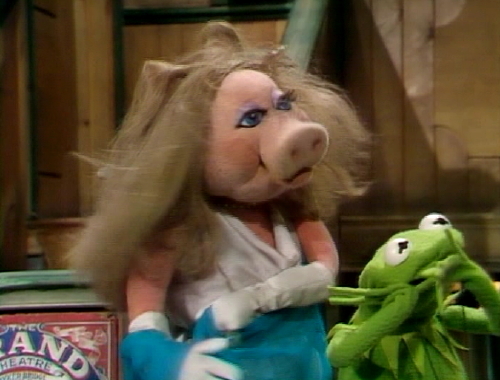 When asked on GMA what attracted her to Kermit in the first place Miss Piggy responded with "those eyes" and complimented his body...then added, as an afterthought, that he has a lot of self-confidence as he walks around naked. Really, pig? 39 years with a guy...frog...and the only thing you can say about him is he has nice eyes? Meanwhile, the sitcom's site reports that Miss Piggy is now dating Josh Groban -- a set-up that Kermit orchestrated after he "feared for his life." 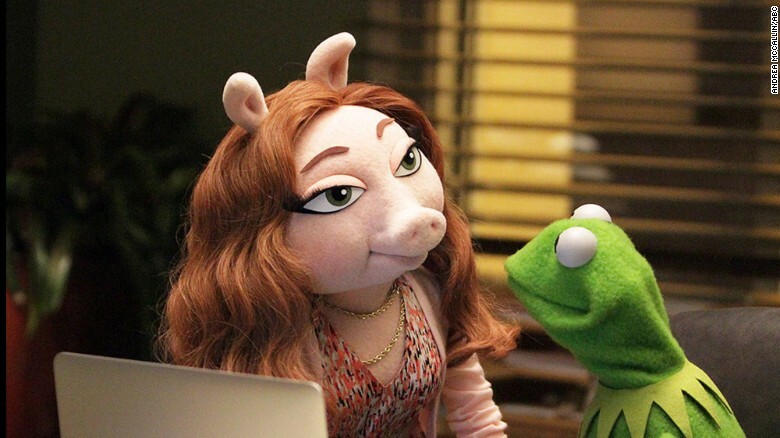 It seems the psycho pig just couldn't let go after the break-up and the fact that Kermit has moved on. It's a wonder Kermit didn't find a boiled bunny in his dressing room. 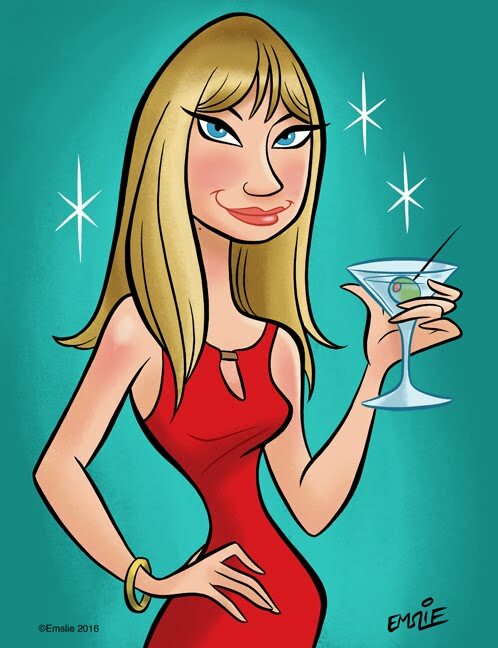 By the way, have you seen his new squeeze? Yes, this is the new she-swine in Kermit's life. A sultry looking redhead with almond-shaped eyes named Denise. (He does like dating outside of his species, it seems.) And this one actually seems to be easy going and has ambitions beyond delusional fame. Good for you, Kermie! As far as Miss Piggy's legacy...I say it's time to retire the porker. Anyone have a spit? I have a craving for bacon, BBQ ribs, and braunschweiger. The best one yet, Pam. I keep saying that. You do what great blogging is supposed to be. "muppet" style and format should not obscure that. So, yeah, maybe its all the better that we remove the happy demeanor from what really is an abusive set of traits. Its more honest than pretending that such behavior is cute and okay. I still have mixed feelings (i.e. the need for honesty vs. nostalgia for more innocent times), but your post makes a very good case. My favorite characters were the two curmudgeons, Statler and Waldorf; they always had the best lines. Miss Piggy was usually in one or two sketches, so as much as I disliked her bits (done by Frank Oz, the same puppeteer that was Yoda)I would tolerate them to get to the Fozzie bit, which was also Frank Oz. Never really understood her popularity, frankly. Fozzie and the curmudgeons were way funnier.